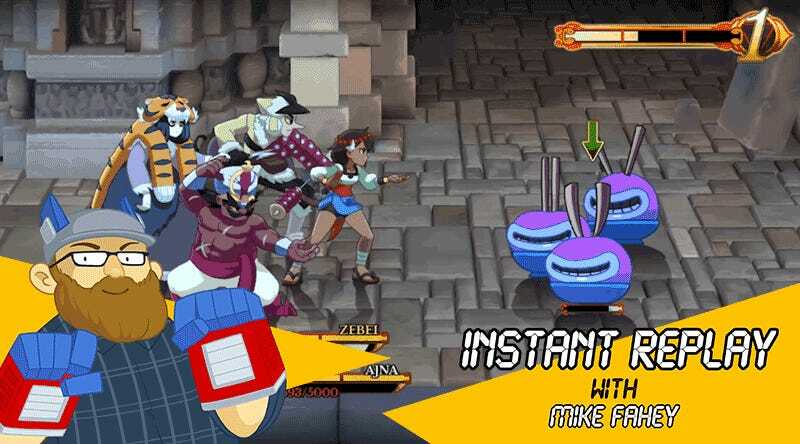 With gorgeous art and animation, gameplay that’s a one part Metroid, one part Valkyrie Profile and music by a legendary Japanese composer, the prototype for Lab Zero’s Indivisible is more exciting than many fully-developed games. The makers of Skullgirls, the little indie 2D fighting game that could, turn their animation prowess and the power of their Z-Engine to the action RPG genre. It tells the story of a rebellious young girl named Ajna, who discovers the power to absorb people into herself and summon them forth in battle when her village is attacked by local warlords. Determined to track down the warlords and learn more about her new powers, Ajna sets off on a world-spanning, mythology-laden adventure. In the game’s playable prototype, available for download on the Indivisible website, we get some silky-smooth platforming, a little Metroid-vania (plants block Ajna’s path until we find an axe to cut them) and combat that will be immediately familiar to players of the classic action RPG Valkyrie Profile. Each of the four characters in battle are assigned one the the control pad’s four buttons. Mash them mercilessly or use them strategically—either way cool things happen. The music is by Japanese composer Hiroki Kikuta, whose work includes such titles as Secret of Mana and Kouldeka (the prequel to Shadow Hearts). His particular flavor is definitely present in the prototype track. Lab Zero has major plans for Indivisible. They’re looking at creating a 20-30 hour main scenario (not including sidequests) for release on the Xbox One, PlayStation 4, PC, Mac and Linux in January of 2018. Of course a project of such scale requires money, and that’s the bit they lack. Lab Zero has launched an ambitious Indiegogo campaign that’s looking to raise $1.5 million, with publisher 505 Games signed up to provide an additional $2 million to complete development should the goal be reached. It’s a long shot, but if the prototype is any indication, Indivisible is a game I’d love to play one day. Check out the game’s webpage and Indiegogo for more information.